It’s taken years for me to be able to hone my swing! I’m still practicing to this day, and I owe much of my improvement on the links to my trusty golfing net. In this Rukket golf net review, I’ll show you how much of a difference this fantastic practice aid can make to your game. A golf net is an accessory you can easily set up at home. It’ll help golfers in need of finding that perfect swing strength without them having to head down to the range. In my opinion, a true golfer never stops perfecting their game! How Can a Golf Hitting Net Help Me? Rukket’s pop up golfing net has been something of a revelation for me. I’m sure many of you can appreciate how tricky it can be to get to the range sometimes. Pulled between real life, work, and everything in between, working on my swing and my accuracy just wasn’t happening. So what was the answer? To start practicing at home. 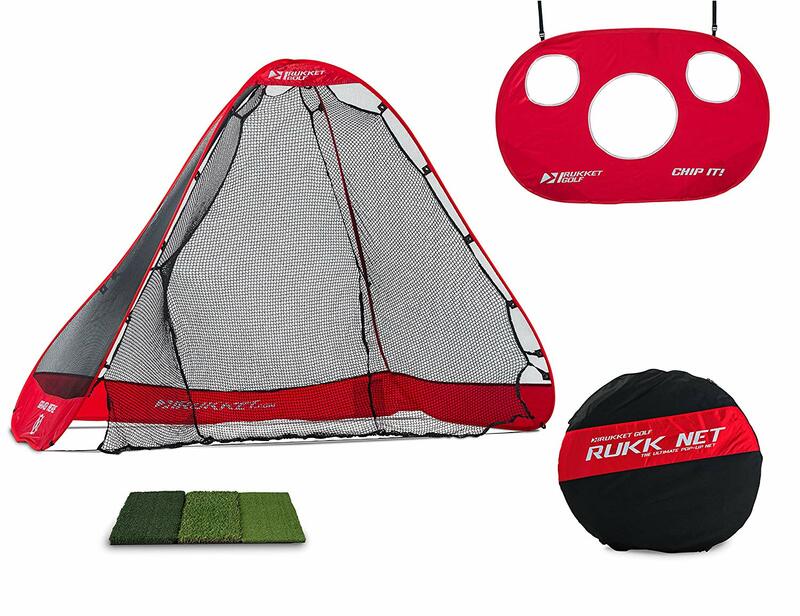 The pre-assembled Rukket net pops up and pops down with surprising ease. That means, even before you start using it, it’s perfectly portable wherever you wish to practice. It can be used indoors or outdoors; however, you wish. At six feet tall, it’s hardly a Goliath, but it’s big enough to do what you need it to do. It’s remarkably heavy duty. Just set up the net in your yard, your garage – even on the range if you like – and start swinging with all the clubs in your bag. Woods, irons, you name it – the Rukk net can take it. What I found impressive is the net’s constitution. I’ve had golfing nets in the past which have gotten knotted, hole-ridden and just generally out of shape. Rukket’s golf chipping net is four ply, which means it’ll never get knotted. Strike those balls into the net with abandon – it’s nice and robust. It also arrives with a series of turfs and a chipping target. In my opinion, this is a great addition. It’s all well and good being able to practice the strength of your swings, but what about accuracy? If you’re a seasoned golfer like me, you’ll no doubt be keen to aim for precision as well as speed. 4 ply net makes for strong return and durability through years of use. The net is supplied with targeting and three separate turfs for you to practice Practice swings and putts at your leisure. It’s very affordable and cost-effective. At less than $50, this is a very reasonable price to be paying for a net which will weather considerable You’ll be looking to pay more than this for a good golfing net. It’s extremely easy to set up. Once it’s up the first time, it will fold back down and can be carried around from place to place. It’s the perfect size for compact practicing. While some golfers may prefer a bigger net, this is ideal for anyone wanting to sneak in some swings in the back yard or garage. It stores flat. You’ll not know how handy this is until you actually pack it down. There is some concern among golfers that the spring quality isn’t great. For the price, I think you’re getting great value. While it’s robust, it probably isn’t the best practice net to be used during heavy weather. You’ll pay more for a net with more features if you need them. You may need to pitch it down with a few stakes depending on where you’re setting up. In this Rukket golf net review, I hope I’ve given you an excellent introduction to an affordable, rugged golf accessory. It may not be the best pick for everyone, but for my personal needs, I’ve found it an ally. It’s perfect for anyone who might be stuck for ways to practice. What’s more, the storability and ease of use are massive boons. There are plenty of pricier golfing nets out there which are cumbersome and a bit awkward to put together. I’d seriously recommend you look for Rukket’s nets if you’re interested in an affordable, portable practice unit. Take a look online now!